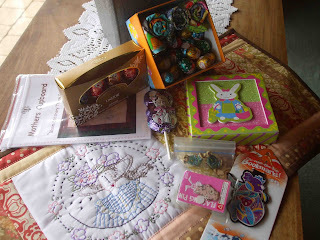 I received a lovely e-mail today from Kirsi my partner in the Secret Easter Swap. Kirsi is from Finland. I made her a table runner using a Red Brolly stitchery which reminded me of an easter bonnet. I also sent her lots of eggs, fabric, bunny buttons, koala bookmark and coasters and a stitchery pattern. I packed the eggs and fabric in a cute litle bunny box. I am so glad that she liked everything. The entries for the giveaway are going well - Good Luck to you all. 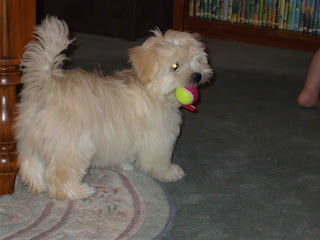 Do any of you remember when I brought Toby home? 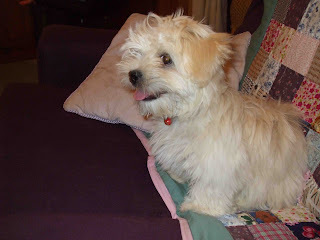 He is now 6 months old and a real rascal. I am off now to get ready for my day out - Have a good one wherever you are !! Toby is gorgeous. More photos would be nice. Toby is a sweetie! Very cute! What a lovely box. I'm here snooping for ideas on what to send you! Tassie in Autumn, no better place to be, well looking in Antique stores is another good place to be as well. Hopped in for the first time today. Toby is so cute. Have a nice antique hunt! Have a great Easter and shopping. How lucky are you, antique shops. Looking for to see what you find. Oh and how cute is Toby. He looks like a rascal too.